Your family is confident with your decision to move your elderly parent into an assisted living community. Perhaps, Mom could no longer care for the maintenance of a big house without your Dad, or Dad is lonely and needs companionship now that Mom has passed away. Whatever the reasons and no matter how comfortable they are with this decision, there are still going to be emotions with this life change that need to be faced for both you and your parent. Think about this transition from your parent’s point of view. Moving is daunting and leaving the familiar behind can be overwhelming to anyone. Often the reasons a parent doesn’t want to move isn’t about the house itself, but rather the memories and sense of belonging that they have invested in a home. It can be stressful, but there are steps that you can take to ease this transition. Shop Around Together. 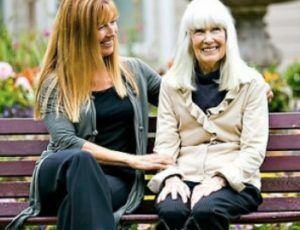 If possible, involve your parent in the selection of an assisted living community. Keep them focused on the future and the excitement of new friends, a new home, and an opportunity to relax from the stresses of home ownership. The more they take part in the selection of their new home, the more comfortable they will be with the decision. Hire Resources to Help. Invest in a moving company to help with the details and stress of moving, so you can focus on the emotional needs. Find a moving company that specializes in this type of move. Or hire a professional organizer who can help your family with decluttering and downsizing their home to take only what will fit into the new space. Keep Familiar Objects. Surround your parent with loved objects in their new home. Respect and honor their past with family photos and their most prized treasures. Think about the design of their new home and how you will decorate their assisted living apartment to make them comfortable. Take Photos. If your parent is moving out of your childhood home, you may be just as attached to the house as your parent is. Take pictures of their old home to remind them what it looks like. Pose for a group photo on the front steps and frame it for their new apartment and keep one for yourself. At Aegis Living, we want to make this transition for you and your loved one as smooth as possible. Visit one of our communities today to take a tour and stay for lunch. We would be happy to introduce you to our staff and our residents.